#photographicmemory is a feature in which someone sends in a photo of theirs and writes about it. It was created because sometimes you can find out more about a person by asking them to describe a photo than by asking them a ton of questions. It was also created because it’s nice to look at pretty photos. I love this photo because it encapsulates my time in Washington DC, where I lived from the age of three to five. Though I don’t remember the moment this photo was taken, the whole picture serves as a collective memory of my blissfully ignorant nursery-school years, many Barbies past. 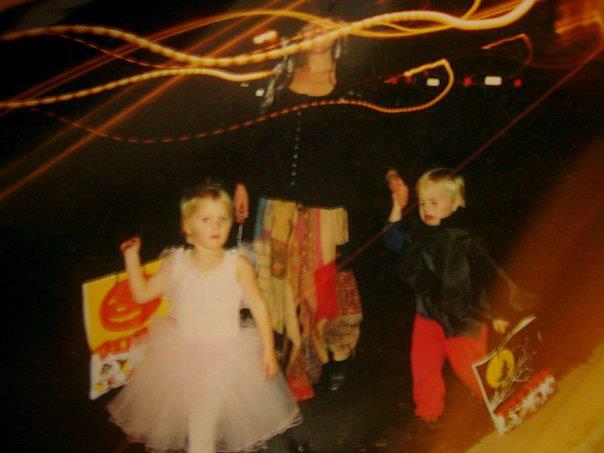 The ballerina is me, the witch is my mother and the little crying bat-boy is my eldest brother, Ludo. My younger brother Oliver would have been about one, tucked in bed while his siblings trick-or-treated for the first time. I actually remember calling the act ‘trickle-treating’. How adorable. The facial expressions of us all play wonderfully off each other. Ludo’s grimace is made comical by the fact that his family members are so unfazed by his misery: I am a fabulous princess with the candy bag, and Mum’s eyes are smiling from behind the Halloween lights strewn across. I look like a real sass monster. In fact, this photo is even more special because it documents the famous haircut that I gave myself after being left in a room alone with a pair of scissors. Mum was devastated, but everyone else found it hilarious. I read this article and found it very interesting, thought it might be something for you. The article is called A Halloween Momento – #photographicmemory and is located at http://prancingthroughlife.com/2013/10/14/a-halloween-momento-photographicmemory/.